The U.S. dollar (USD) is on thin ice. See for yourself. This chart shows the performance of the U.S. Dollar Index since the start of 2017. This index tracks the dollar’s performance against major currencies like the Japanese yen and the euro. Notice how the dollar stopped rallying in November… lost momentum… and has since fallen 1.5%. That’s not a huge decline. But the dollar now looks like it could roll over any day now, and head much lower. 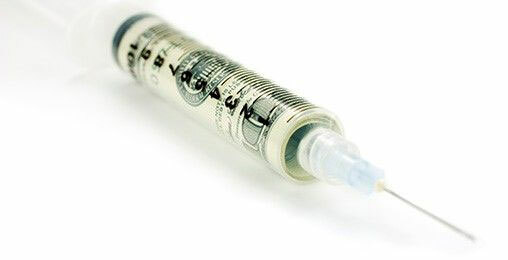 In a minute, I’ll show you why… Then, I’ll share four ways to profit from a weaker dollar. And Strategic Investor editor E.B. Tucker will show you a bonus way to profit in today’s Chart of the Day. 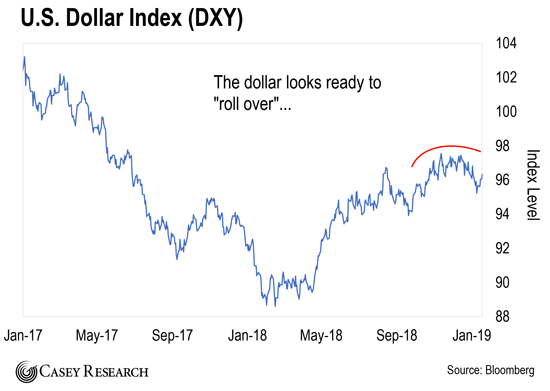 But first, let’s look at why the dollar is set to fall further from here. Worth over $150,000 PER tablespoon, one tiny $7 million firm is injecting “world’s most valuable substance” into patients for life-changing profits. It’s going to put its plan to raise rates on hold. You see, the Fed has raised its key interest rate nine times since the end of 2015. It also talked about hiking the key interest rate two more times in 2019. But it’s clear that’s not going to happen anymore. I say this because Fed Chair Jerome Powell said last Wednesday that, “the case for raising rates has weakened somewhat.” The “official” reason is because of Brexit, the global economic slowdown, and the trade war. But you don’t have to work on Wall Street to realize that Powell only delivered this message after U.S. stocks sold off – hard. In other words, the Fed appears to be backpedaling because it knows the U.S. stock market is addicted to cheap money… and it doesn’t want to take away the punch bowl. In short, this is a huge deal… and one with bearish implications for the U.S. dollar. In other words, investors park money where they can earn the best returns with the least amount of risk. When the Fed was raising rates, the dollar looked like the best place for big investors to park money. But that’s not the case now that the Fed has changed its tone. Other currencies like the euro now look attractive. Unless the Fed changes its tone again, expect the dollar to keep weakening. Just look at this chart of the euro, the official currency of the European Union. Notice how the euro fell relative to the dollar practically all of last year. But that sell-off lost steam in November. 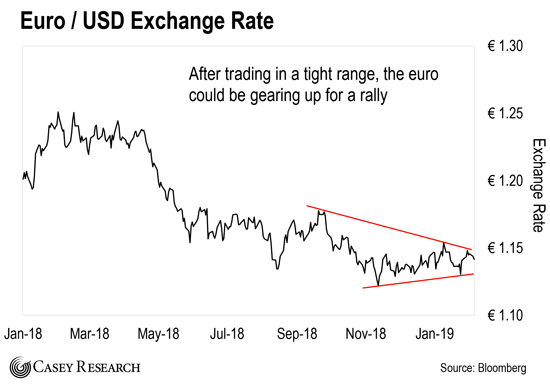 Since then, the euro has been “carving out a bottom” relative to the dollar. In short, the euro’s doing the exact opposite of what the U.S. Dollar Index is doing. It looks like it’s gearing up for a big rally. Just to be clear, I realize that the euro is a structurally flawed currency. It has major problems that will eventually lead to its own demise. But that doesn’t mean that it won’t outperform the dollar over the next few months. 3) You can bet on emerging markets (EMs). Emerging markets are countries that are on their way to being developed countries like the United States and Germany. China and India are the two biggest emerging markets. As I explained in the January 17 Dispatch, a weaker dollar would make it easier for many EMs to finance their debts. And that would be good for EM stocks. 4) You can also bet on higher commodity prices. You see, most commodities are priced in U.S. dollars. 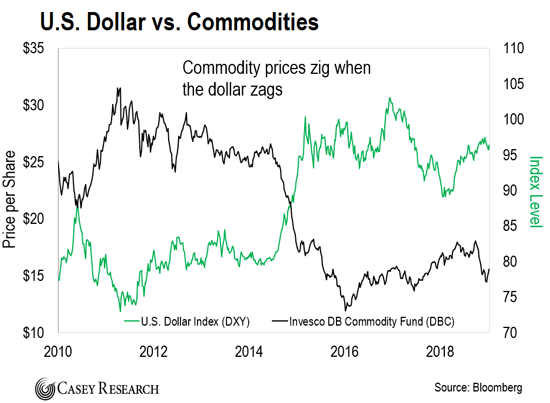 Because of this, commodity prices generally have an inverse relationship with the dollar. Just look at this chart. The green line represents the U.S. Dollar Index. The black line tracks the Invesco DB Commodity Index Tracking Fund (DBC). You can see the commodity prices tend to zig when the dollar zags. In closing, a weaker dollar could be the spark that ignites the next big commodity rally. To speculate on commodities, you can buy DBC or a similar fund. DBC is designed to track a basket of different commodities. That makes it an easy way to bet on higher commodity prices. Just remember that commodities are highly speculative. So don’t bet more money than you can afford to lose. 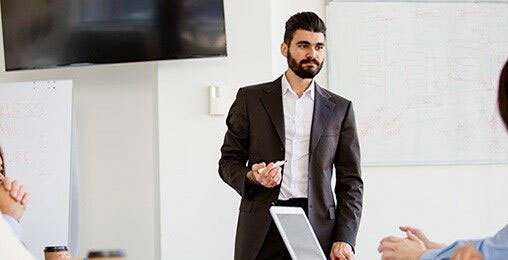 Have a risk-management strategy. Use stop losses. And take profits when they come. 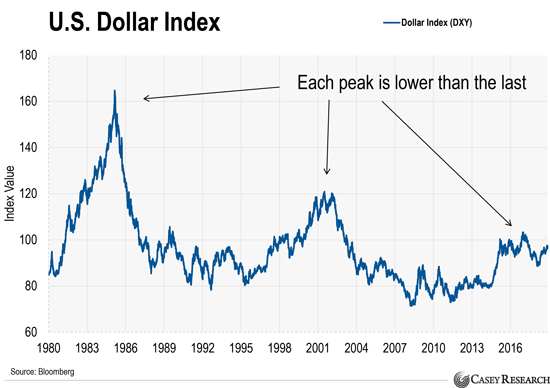 In the chart below, we plotted the U.S. dollar going back to 1980. As you’ll see, it makes lower highs after each plunge to new depths. After a historically weak rally over the past few years, it looks like we’re on the cusp of another plunge. Owning foreign stocks that trade on the U.S. exchange gives us a way to profit from a falling dollar. As the dollar falls, it takes more dollars to buy the same share of stock. If those foreign stocks rise on their home exchanges at the same time, U.S.-listed shares soar even further. From 2002-2007, having even a small part of your portfolio positioned in U.S.-listed foreign stocks meant big investment returns. For example, shares of Swiss conglomerate Nestle (NESN:SW) rose 47% from 2002-2007 on its home exchange. However, U.S. investors who bought Nestle (NSRGY) shares priced in dollars on the U.S. exchange rose 119% over the same period. Over this period, the company performed as usual. 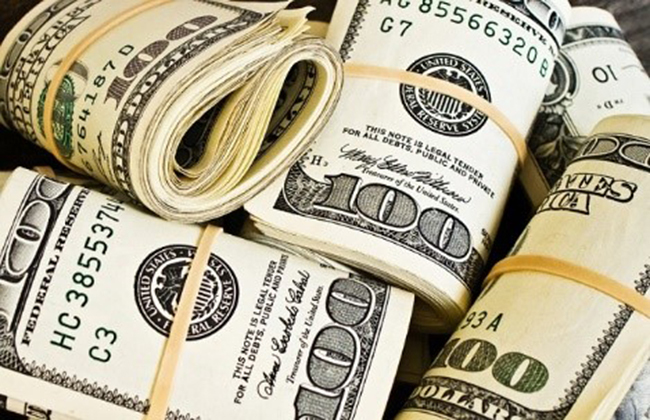 The additional gain came from the dollar weakening against the Swiss franc. If the dollar rolls over like we expect it to, look to add foreign stocks – specifically, industry leaders that pay solid dividends – that trade right here on the U.S. exchanges. What steps are you taking to protect yourself from a falling dollar? Do you think investing in emerging markets, commodities, or foreign stocks on U.S. exchanges is the best way to play it? Let us know at [email protected]. 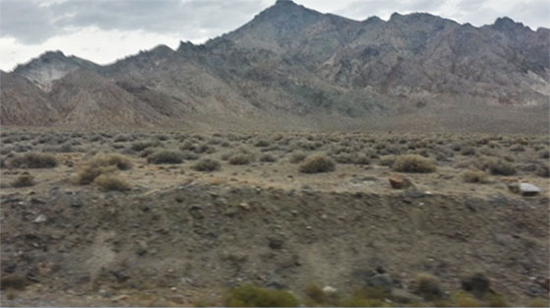 It might not look like much, but this barren strip of land holds a secret. In fact, Dave Forest was recently able to make 5,205% in two months by unlocking this secret.